On this date in 1242, the knight, outlaw, and pirate William de Marisco was drawn by a horse to Coventry and put to the pains of disemboweling and quartering — albeit only after he had already been hanged to death. 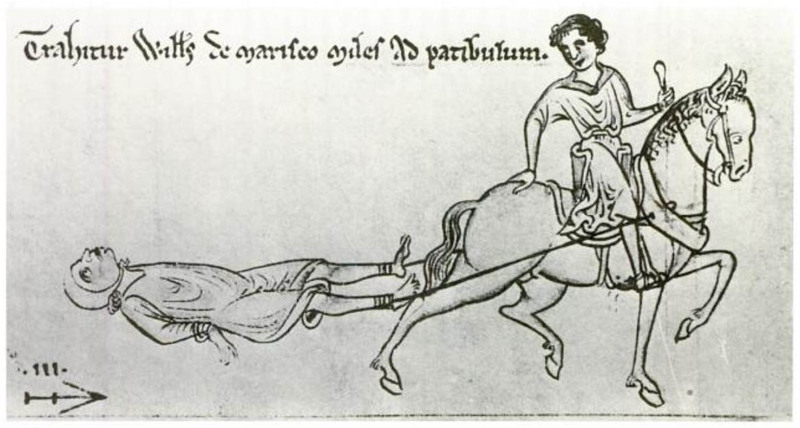 Illustration of William de Marisco’s execution by the amazing 13th century chronicler Matthew Paris. 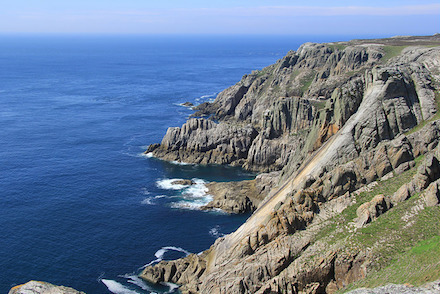 Lundy’s west coast. (cc) image by P_Dean. There, as our chronicler-illustrator Matthew Paris describes, he made his way thereafter by piracy. Whilst these occurrences were taking place, William Marsh [“de Marisco” means “of the Marshes” -ed. ], son of Geoffrey Marsh, took up his quarters on an island near Bristol, called Lundy, a place impregnable by the nature of its situation, where he lived like a pirate with a number of proscribed and wicked men, indulging in plunder and rapine, and, attended by his companions, traversed the places on the neighbouring coast, despoiling the inhabitants of their property, especially wine and other provisions. 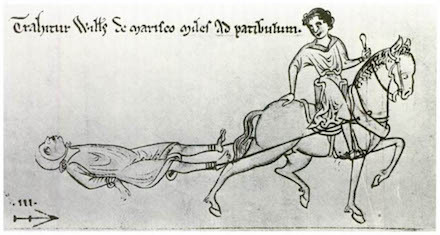 By sudden incursions lie frequently carried off vast booty from the country lying near the island, and in many ways injured the kingdom of England both by land and sea, and caused great loss to the native and foreign merchants. William de Marisco would manage seven years on the lam, seizing victuals and booty and ransomable hostages as he could from his island fastness. He’d been dispossessed of his lands in Ireland and nursed against King Henry the personal grudge of an aggrieved nobleman. on the day after the Nativity of St. Mary, a certain learned esquire, as it is said, came to the king’s court at Woodstock, pretending that he was insane, and said to the king, “Resign to me the kingdom, which you have unjustly usurped, and so long detained from me;” he also added, that he bore the sign of royalty on his shoulder. The king’s attendants wanted to beat him and drive him away from the royal presence, but the king prevented those who were rushing on him from violence, saying, “Let the insane man rave as becomes him, for such people’s words have not the influence of truth.” In the middle of the night, however, this same man entered the king’s bedchamber window, carrying an open knife, and approached the king’s couch, but was confused at not finding him there, and immediately began to look for him in the several chambers of his residence. The king was, by God’s providence, then sleeping with the queen. But one of the queen’s maids, named Margaret Biseth, was by chance awake, and was singing psalms by the light of a candle (for she was a holy maid, and one devoted to God), and when she saw this madman searching all the private places, to kill the king, and frequently asking in a terrible voice where the king was, she was greatly alarmed, and began to utter repeated cries. At her dreadful cry the king’s attendants awoke, and leaped from their beds with all speed, and running to the spot, broke open the door, which this robber had firmly secured with a bolt, and seized the robber, and, notwithstanding his resistance, bound him fast and secured him. He, after some time, confessed that he had been sent there to kill the king, after the manner of the assassins, by William Marsh, son of Greoffrey Marsh, and he stated that others had conspired to commit the same crime. Paris has evident contempt for William, but he does note that “William boldly denied all these charges, yet he did not obtain any credit, nor was he listened to; he therefore, however unadvisedly, betook himself to out-of-the-way places, and became a fugitive and an outlaw.” It is not clear to this author that outlawry is “unadvisable” vis-a-vis standing to the judgment of a king who is certain you have attempted his life; nevertheless, it is usually little better than the temporary expedient for the doomed. On the feast of St. James, by the king’s order, the said William, with sixteen of his accomplices taken with him, was tried and condemned, and, by the king’s order, was sentenced to an ignominious death. He was, therefore, first dragged from Westminster to the Tower of London, and from thence to that instrument of punishment called a gibbet† suspended on which he breathed forth his miserable life. After he had grown stiff in death, his body was let down and disembowelled; his entrails were immediately burnt on the spot, and his wretched body divided into four parts, which were sent to the four principal cities of the kingdom, that the sight of them might strike terror into all beholders. His sixteen accomplices were all dragged through London at the horse’s tail, and hung on gibbets. The said William, after his condemnation, when about to imdergo the sentence pronounced upon him, invoking the divine judgment to witness, boldly declared that he was entirely free and guiltless of the crime of treason imputed to him, and likewise of the murder of the aforesaid clerk Clement; he also asserted that he had betaken himself to the aforesaid island for no other reason than to avoid the king’s anger, which he had always above all things wished to pacify by submitting to any kind of trial, or by any other humiliation; but that, after he had taken refuge as a fugitive in the said island, he was obliged to prolong his miserable life by seizing on provisions wherever he could find them. He then poured out his soul in confession before God, to J. de St. Giles, one of the brethren of the Preacher order, and confessed his sins with contrition, not excusing himself and giving vent to evil words, but rather accusing himself. This discreet preacher and confessor then administered gentle comfort to him, and dismissed him in peace, persuading him that he underwent the death to which he was doomed by way of repentance. And thus, as before mentioned, horrible to relate, he endured not one, but several dreadful deaths. Readers of Latin can peruse the transcript of the trial, which has surprisingly survived the ravages of century, in this 1895 English Historical Review article. * Pembroke’s brother and heir was also suspected initially, but was able to clear himself; however, he was later made to take a vow no longer to protect William de Marisco, suggesting that Pembroke was at least in simpatico with the hit. Both William and Geoffrey de Marisco had been fined previously for adhering to the Pembroke side in a fight with the king. ** The Templars at best barely possessed Lundy and the Mariscos who claimed it opposed those banker-knights’ stake, successfully. † Paris’s unfamiliar marking of the term “gibbet” is interesting here; according to dictionary.com it was during the 13th century that this word for gallows entered Middle English from French.